Just some black and white helmets for those that can’t decide on a colour. Carbon Touring helmet looks like it belongs in the future. 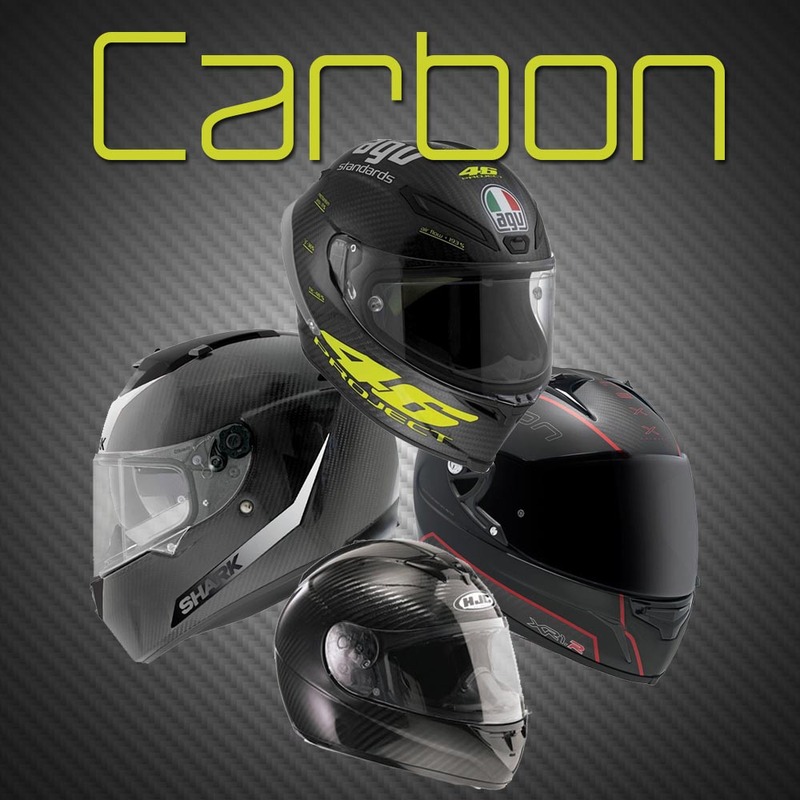 Built using carbon shell, very light, it is good for all sorts of motorbiking, the sun visor on the top make it a great touring helmet. It has removable lining and chin curtain. It comes with the yellow visor which gives better vision in low light. Coming in at around £399, which is an average price for a carbon lid. Diesel, yes, the clothing company, are getting into motorcycle gear, the have a choice of 3 styles of helmet. The Mowie, an open face 3/4 size helmet, The Hi-jack, open faced, designed to look like a helicopter pilots helmet and the Full-jack, which is a full face helmet. These helmets have been given the full Diesel going over so they are very stylish and come in a range of colours. Not putting style over substance, these lids are made by AGV. Getting ever more popular, carbon lids are not only stronger and lighter, but are more affordable. Here are a small selection, with price and the all important weight. This is the logo motorcyclists look for when buying clothing for those unpredictable journeys, but what is it? Gore-tex is a thin material that claims to be waterproof, windproof and breathable, so how do they achieve this? The waterproof part is made by the microscopic pores on the membrane are 20,000 times smaller than a water droplet, which means water droplets can’t pass through. Garments have a treatment called DWR – a durable water repellent polymer – applied to the outermost fabric layer so that water beads up and rolls off. To make the material breathable, The pores are 700 times larger than a water vapour molecule which means perspiration passes right through. It is not, as many believe, about a fabric’s ability to let air move through it, rather it refers to how well it let’s your sweat escape in the form of moisture. The windproof part is the volume of air that passes through one square meter of fabric in one second (l/m²sec) is 5.0 or less, creating a truly windproof membrane. A fabric can only be considered truly windproof if the air permeability is 5 l/m2sec (volume of air that passes through one square meter of fabric in one second) or less. 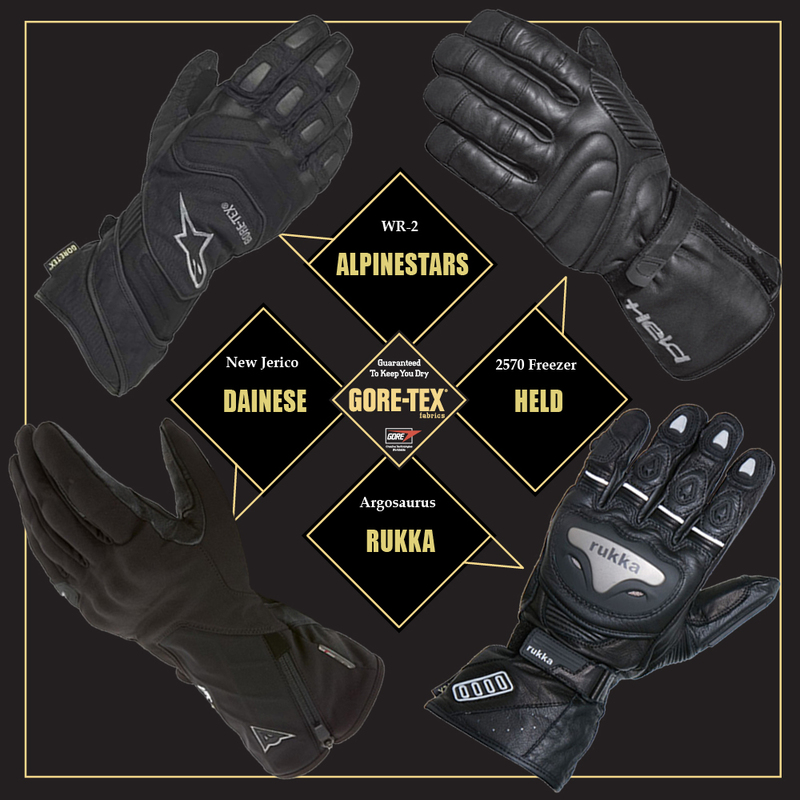 All gore-tex products meet or exceed that standard. So next time your purchasing a new pare of winter gloves, look out for the wee Gore-tex logo. Shark helmets have a very interesting range for 2014, especially the Metro division range. This range includes the Shark Raw helmet that I posted back in February. 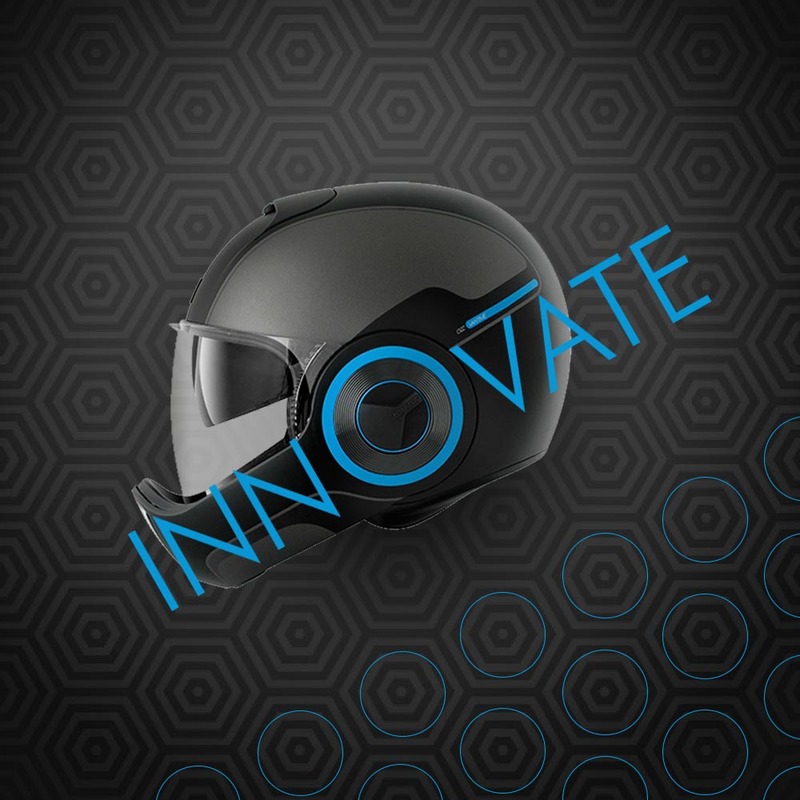 The Shark Vantime is a full face helmet that has a very unique styling, it has a long visor that it shares with the Shark Nano, a smooth surface, (except the matt version) and a pop down sun visor. What makes it different from other lids on the market is the slightly extended chin guard that the visor goes behind. I noticed this lid at the motorcycle show and was instantly intrigued with it. The helmet looks like what helmets of the future will look like. It’s available in black, grey, white or matt black, but knowing “shark” That colour range will increase. As a motorbike rider you are open to the elements, clothing has come a long way in the last couple of decades. Technology and new materials make surviving an accident greater than it was all those years ago. But can wearing all this safety gear ruin the experience of freedom on the road? Motorbike boots, trousers, jacket glovers and helmet are the most basic of kit, would you want to have more things to put on? Your neck is the most vulnerable part of your body in an accident, but most people on the road don’t wear a neck protector. So is the new developments in air-bag technology on some bike and in jackets really safer if the time comes that you need it? 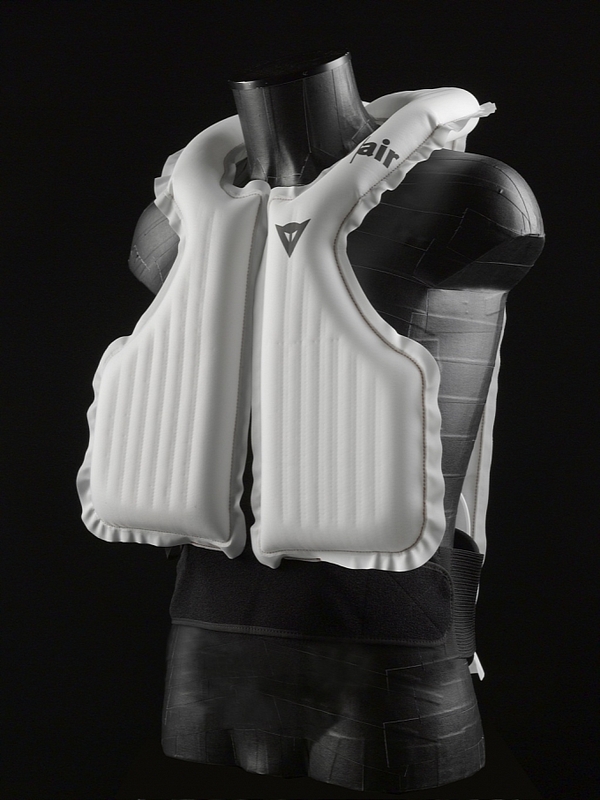 If the airbag is another added item to put on for that small journey most people will chose to “just leave it at home today” but if tech like this is integrated into your next jacket, would you buy it?, and possibly pay that “big bit” extra. Honda Goldwing have an airbag built into there bike and companies that manufacture clothing are starting to sell the tech in their clothing, but it’s still too expensive, for now. We all like our information, charts, graphs, anything you can look back on and dissect. So, I thought what can I use for runs out on the motorbike. I used to go a run, and when I got home I would map out the run on google maps and post it in the runs section. Now, there are apps for that, not perfect as they are designed for running and cycling, but they gather up good information, and map your route. I looked at the many free apps available for download, and rounded it down to two to try out, the Nike+ app and Endomondo. Both mapped my route and gave information such as top speed, average speed, altitude distance and duration. Other information available is calorie count which I don’t think is very accurate. 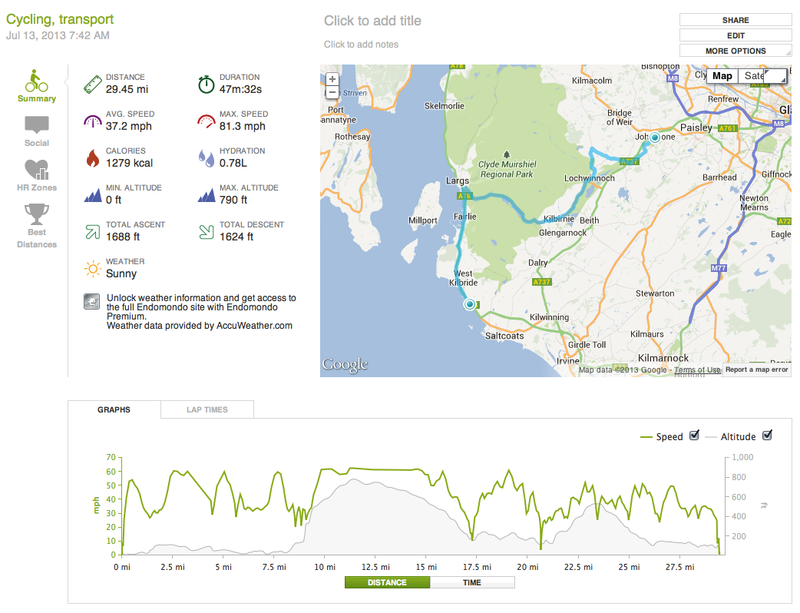 My personal preference was the Endomondo app, I felt was a bit better designed and more stable with the gps signal. The web site is also easier to navigate round. It displays all your activity in a calendar and shows all your info when clicked. Below is a screen shot form the Endomondo website. So if you like your information breakdown, these apps are good fun, but be aware, the max speed might be a bit incriminating. 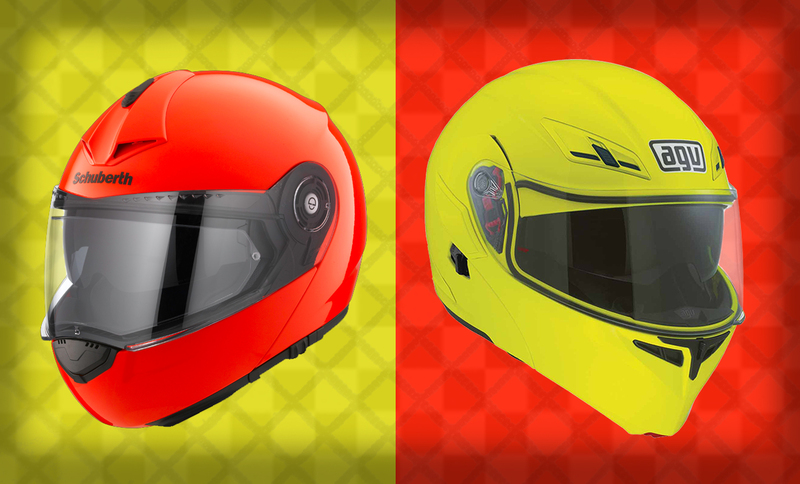 These two, brightly coloured lids are designed for sport riding but have the functionality of touring helmets. They have been tested in wind tunnels to maximise their aerodynamic design, but have flip-up faces like most touring helmets. So now you can shave a few seconds off your pit-stop. A sports helmet that is also a flip-up. It promises lo noise at high speed and can be fitted with Schuberths SRC-system. Also uses materials such as Coolmax, Interpower and Thermocool, thats comfort for your face. It’s 1,570grams light. Agv’s new top range lid is the same kind as the Schuberth C3 Pro, a sports helmet that is a flip-up. The innards are made of Breathable Lycra and Dry-comfort fabric with sanitising treatment. When on your on your travels, it’s nice to book into a b’n’b, and live the life of luxury, but this can be on the expensive side, especially in the height of the summer months. So camping is the other alternative, and choosing the right tent is important. A solo biker would be better with a two man tent, it will sleep you and still leave space for your motorbike gear, and it’s small enough to fasten onto the back of your bike. 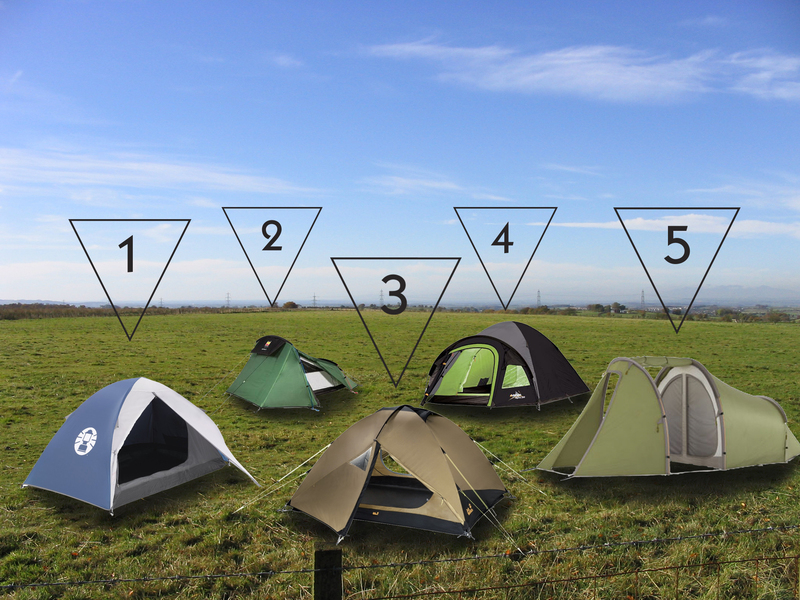 Here are a few 2 man tents in a range of prices.